The International and Pan-American Copyright Conventions. No part of this publication may be reproduced, stored in a retrieval system, or transmitted, in any form or by any means, electronic, mechanical, photocopying, recording, or otherwise without the written permission of Enigma Books. 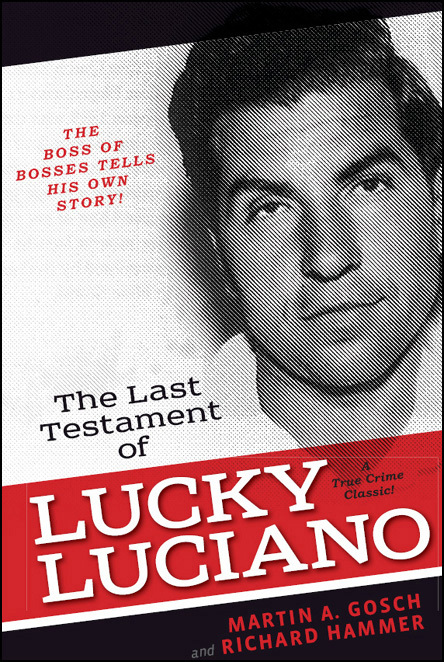 Early in 1961, Charles “Lucky” Luciano made a decision. He was then sixty-three and more than half his life had been devoted to crime, much of it as the overlord of the organized underworld in the United States; he had been its ruler even during fifteen years of exile in Italy. But at that moment, his position, whatever it was, was shaky. His health was not good: he had already suffered a major heart attack. And now his life had been threatened by his onetime friends and associates back in America. Luciano’s decision was that his passing should not go unattended, that the portraits painted of him in the past, which he considered at least partially untrue and greatly distorted, should not be the only ones left behind. Someday, he wanted the truth, as he saw it, told about his life, about his ambitions and how he had achieved them, about his crimes, about those he had known and dealt with; it should be told not at that moment but later, when retribution could no longer fall upon him or most of those directly involved in his life. It was the decision, perhaps, of a bitter man. For some months he had been directly involved in a proposed motion picture loosely related to the later years of his life. It was the first time, despite the entreaties of film producers through the years, that he had ever authorized such a project or cooperated on one. On February 18, he had read the script and approved it and given his word that he would do all he could to help in its making; in return, he was to receive $100,000 and a percentage of whatever profits the movie earned. He had taken two copies of the script that day and sent one to an actor in Hollywood he wanted to portray him, keeping the second copy for himself. Within a few days, however, he had received very unsettling news. Tommy Eboli, then the caretaker for the underworld interests of Vito Genovese, who was serving a term in federal prison for narcotics conspiracy, arrived in Naples with orders from New York. The rulers of the American underworld had decreed that there was to be no picture. After a moment, in a strained voice, Luciano said, “Marty, I’m gonna let you read somethin’. I want to prove that you are the guy I trust and that I’m only doin’ what I have to do.” Luciano took a plain piece of white stationery, folded in half, from his inside jacket pocket, and handed it to Gosch. “Dear Charlie,” the note said. “We have decided that the picture you want to make is a bad thing at this time, for all the reasons you know. The Little Man would be very upset if you decided to go ahead. So you better not do it.” The note was unsigned. “How did you get this?” Gosch asked. Gosch and Luciano had come together to make a movie, a movie that was to be essentially fiction, and Gosch was not sure that he wanted to know any more about the exiled American racketeer.